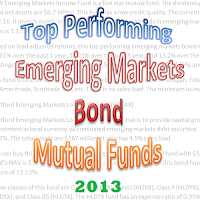 This GMO Emerging Country Debt Fund is the best performing emerging markets bond mutual fund for January 2013. Its objective is to provide total return that will exceed its benchmark. It invests directly and indirectly in emerging countries debts. Thomas F. Cooper is the fund manager since 1999. It has 8.16% yield. The expense ratio is only 0.64%. This taxable bond fund is ranked with 4 star rating by Morningstar. For 2012, the YTD return is 26.72%. The top 2 bond holdings are Bolivarian Republic Venezuela 11.95% and Republic Of Congo Sr Unsecured Regs 06/29 Var. The top 3 sectors are government bond (50.40%), corporate bond (29.25%), and asset-backed bond (4.78%). Transamerica Emerging Markets Debt Fund has $726 million of assets. This emerging markets bond fund utilizes its assets to purchase debt securities of issuers located in emerging markets countries. The fund’s yield is 3.86%. Its expense ratio is 1.21%. It has a sales load of 4.75%. The fund has an average effective duration of 6.09 years and an average effective maturity of 11.29 years. The average credit quality is BB. This fixed income fund also has a turnover rate of 305%. You can buy the mutual fund with $1,000 initial funding. TCW Emerging Markets Income Fund is a five star mutual fund. The dividend yield is high, 5.07%. Its total net assets are $6.7 billion. This fund has a low credit quality. The current fund’s shares price is $12.16. It invests mainly in corporate and government bonds in emerging market countries. Its expense ratio is 1.15% per year. Based on load adjusted returns, this top performing emerging markets bond mutual fund has returned 20.61% over the past 1 year, 14.21% over the past 3 year, and 13.2% over the past 5 year. The top 3 holdings are Petroleos De Venezuela Sa 8.5%, Odebrecht Fin 144A 7.125%, and Mexico(Utd Mex St) 8%. This fund is offered by 64 brokerages. The brokerages include: JPMorgan, Fidelity Retail FundsNetwork, TD Ameritrade, Scottrade NTF, etc. There is no sales load. The minimum to invest is $2,000. Hartford Emerging Markets Local Debt Fund objective is to provide capital growth and income through investment in local currency-denominated emerging markets debt securities. The 12-month yield is 2.97%. The total assets are $167 million. It also has 4.5% sales load. 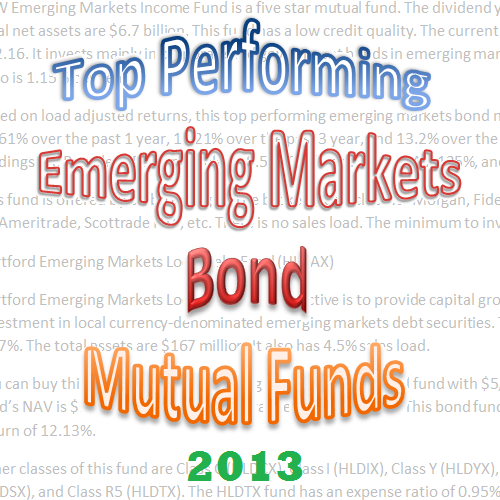 You can buy this top performing emerging markets bond mutual fund with $5,000 initial funding. The fund’s NAV is $10.41. The 52-week price range is $8.85-$10.43. This bond fund has a 1 year annualized return of 12.13%. Other classes of this fund are Class C (HLDCX), Class I (HLDIX), Class Y (HLDYX), Class R3 (HLDRX), Class R4 (HLDSX), and Class R5 (HLDTX). The HLDTX fund has an expense ratio of 0.95% and there is no sales load. Ashmore Emerging Markets Corporate Debt Fund has only $38 million of assets. Its expense ratio fee is 1.45% per year. As of December 2012, the portfolio turnover rate is 50%. It also has a high dividend yield of 6.94%. It utilizes its assets to buy bonds issued by corporation located in emerging market countries. This top performing emerging markets bond mutual fund has returned 12.35% over the past year. The top 2 holdings are Digicel Grp 144A 8.25% and Dubai Hold Comm Op 4.75%. The minimum initial investment is $1,000 for regular brokerage. Managed by Samuel Finkelstein and Ricardo Penfold, this Goldman Sachs Local Emerging Markets Debt Fund invests mostly in sovereign and corporate debt securities and/or currencies of emerging market countries. The yield is 4.73% and the sales load is 4.50%. Its annual expense ratio is 1.27%. Morningstar ranks this emerging markets bond fund with 1 star and negative rating. It has returned 10.51% over the past year, and 6.94% over the past 3-year. The fund’s shares price is $9.94 (1/14/2013). The 3 year beta risk is -0.07.